Cabaret Diosa Expeditions goes up and around Aconcagua Great Winds, Great Beef and Great Wine (not necessarily in that order)! Our journey took us to the beautiful Argentinean city of Mendoza, full of green plazas, restaurants serving delicious food and wine and, of course, the ultimate life style choice - afternoon siestas! Although our 3-week expedition started in Mendoza, our destination was not the nightlife (a serious adventure could be had! 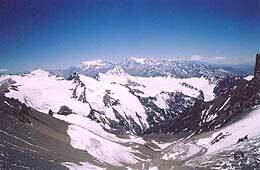 ), but the highest mountain outside of the great Himalaya - Cerro Aconcagua at almost 7,000m. Our plan was to establish 04 camps on the mountain, summit and return to Mendoza via Playas de Mulas on the other side, therefore making a circumnavigation of this great mountain. We departed Mendoza taking the north route on our three day trek through the beautiful desert valleys, Vacas and Relinchos, dramatically enclosed within the mountains of the Andes. Mules carried our gear as we acclimatized. 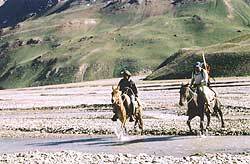 The muleteers, or "gauchos", brought great life to our trek. These hardened cowboys rode and maneuvered the loads with great skill and precision. Watching the gauchos on horseback at full gallop chasing down Cabaret Diosaaway mule and negotiating the winding and narrow canyon trails was like a scene from the wild west - an amazing and unbelievable feat. Hell, I live in Texas, but I've never witnessed such horsemanship as on this trip to base camp with the gauchos. In addition to their great riding skills, the gauchos have an affable nature, and are great cooks. They prepared us some of the great Argentine beef on our first night out, the stars opening up the sky in a great (upside down, southern hemisphere) display of light. As we finished our second day, the dramatic East Face of Aconcagua finally appeared. Too beautiful! On our approach, we experienced windy weather, nothing too serious, but we generally had clear, blue skies. We enjoyed the beautiful landscape unfolding around us, not to mention the glorious site of a huge condor gliding down the valley. We heard from returning climbers that they had summited with little wind and had hours-long stays at the top of the mountain. We were pleased to hear this, but knew that Aconcagua never stays wind-free for long. 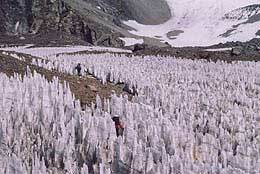 The the seldom-used Argentine Base Camp, situated at 13,776ft, was a welcome site after the 30 mile trek-in. Nicely acclimatized, we took a well-deserved rest day, where we ran into some old friends, met some new ones, and prepared for our ascent further up the hill. Our plan was to establish 04 camps on the mountain: Camp 01 at 16,075ft, Camp 02 at 17,700ft, Camp 03 at 19,200ft and half night at Camp 04 at 20,600ft on the North Ridge. This schedule with rest days allowed for the best possible conditions to summit, provided the weather cooperated. We established Camps 01 and 02 with little difficulty, although the Penitentes (ice spires) were a little tricky to negotiate en route. Winds pounded us on occasion, but we remained optimistic about the days ahead. We were feeling healthy, eating well, sleeping great (except, of course, for the intense high altitude dreams that one experiences - I always love hearing of these. Don't worry folks, I know nothing', and am smart enough to keep what I've heard to myself!) Well-acclimatized, with a couple of trips from BC to C1 and C2 under our belts, we were enjoying the climb high - sleep low plan and were ready to make our move. We established our Camp 03 just below the Polish Glacier as quickly as possible. I had made an ascent to Camp 03 days ago with a load of future provisions. The wind had not diminished since that load carry. We strengthened an old rock wall that would hopefully give us some relief from the great winds. Wrong. From here on out, we were simply pounded by the wind, sleet and snow. The following day during a few hours of clear weather, we were able to traverse to Piedra Blanca (White Stones) and establish Camp 04 at 19,600ft, lower in altitude than planned. We knew, however, that if the weather gave us a break, we could summit from this camp. En route to camp 04 in the short window of clear weather, we enjoyed lovely views of the Andes, the surrounding valleys and the Polish Glacier. We were tired and wind blown, but generally felt healthy. We had strong determination, but most importantly, we needed the weather to cooperate. We gathered ice and snow for melting for drinks and soup. Throughout the night, we continued boiling water to stay hydrated, and enjoyed a good meal. But the weather just got worse. The storm on the mountain hit us hard during the night with 80 mph winds. We were secure and safe for the time being, but we had to make a tough decision. We gave it until mid morning the following day, but decided that we had to take the safest course of action, which was to break camp and descend to Plaza de Mulas at the very next relief of the pounding winds. When the break came, we began our long descent. The hot drinks and the great food were surely enjoyed when we arrived at Plaza de Mulas. All safely down. Next day, we loaded the mules and began our trek out via the Horcones Valley, arriving back in Mendoza late evening. We had a couple of days to enjoy 500 gram steaks, Malbecs and Cabernets, and the culture of Argentina's exciting city life. This year, unfortunately, the weather was not on our side. Our summit goal was not reached, but we faced a great challenge and had a great adventure making the circumnavigation of Aconcagua. We returned safe, strong, healthy and well-fed, though tired. Sometimes the mountain just wins. We had great laughs together and we'll be back soon enough. View MORE . http://southafricatoday.net iq option app best trading app download option.